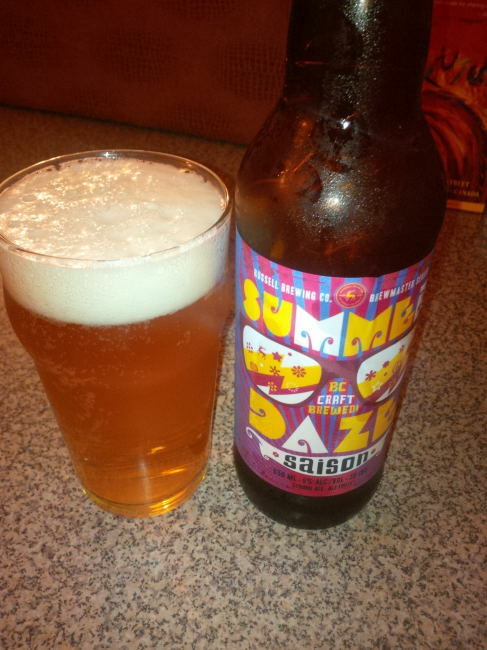 From Surrey BC’s Russell Brewing Company comes their new limited release the “Summer Daze Saison”. This saison pours a golden yellow colour with a white head. The aroma consists of wheat, yeast, citrus and clove. The flavour was of wheat, yeast, citrus, pepper and some sweetness. The alcohol content of this brew is 6% with an IBU of 30. This was a very well crafted saison and is worth of anyone picking it up for a try! Commercial Description: Purposely brewed on a sunny day with the weekend in mind. Crafted in the Belgian farmhouse tradition using Belgian Pilsener malt, special aromatic malt, wheat malt and a touch of clear Belgian candy syrup, balanced with German Hallertau hops. Our Summer Daze is dry to the finish with great hop character throughout and a slight peppery nose. Kick back, relax and enjoy! This entry was posted in Saison and tagged bc, beer, canada, citrus, pepper, russell brewing, saison, summer, surrey, sweet, sweetness, wheat, yeast.